Depending on when you’re reading this, there could be some really fantastic kit left, including skinsuits signed by summer and winter Olympic superstar Clara Hughes and USA Champion Evie Stevens, a German Champs’ jersey signed by the inimitable Ina-Yoko Teutenberg, and a lot more. It’s all auctioned in aid of the team’s charity, Right To Play, and some of it is at ridiculous prices like 99c – this could be your chance to buy a piece of women’s cycling history, AND help out a really good cause – and imagine how happy the women’s cycling fan in your life would be, if you gave them these! Click through right now and get bidding! If you’d like to buy other Specialized-lululemon kit and t-shirts, and help the team, they’ll be available on the team website before Christmas – if you’re interested, keep checking back to them. I’ve talked before about USA road, cyclocross and MTB rider Meredith Miller, and her annual Pretty In Pink campaign to raise money for Hope Lives! The Lydia Dody Breast Cancer Foundation – and wouldn’t be great to give or receive a present that helps a cyclist support a cause she believes in? There are gifts for every budget – “Pink is the new fast” socks for $10 (see the top right hand side of Meredith’s website) and $69 cycling jerseys for women and men, available from Voler. All proceeds of sock sales and 15% of jersey sales go to the charity – isn’t it great to buy nice things that also do good? 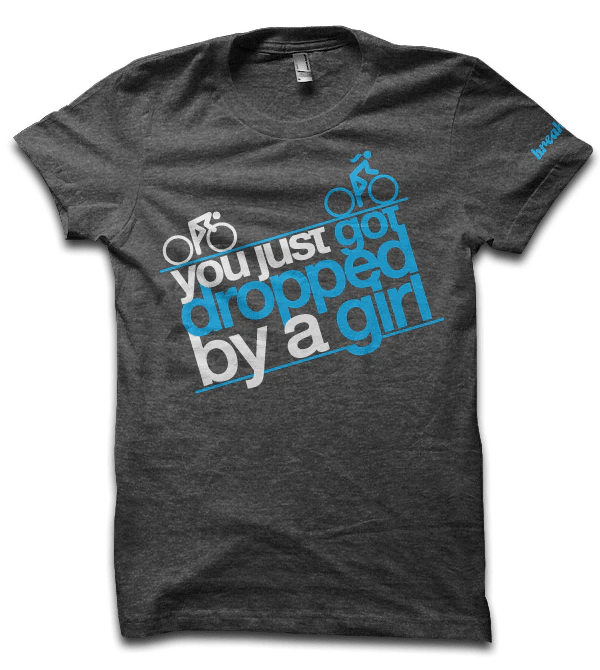 Earlier in the year, Meredith was also selling Pink Is The New Fast t-shirts through Breakaway – and when I was having a browse around their website, I saw this t-shirt, “You just got dropped by a girl“, which made me laugh, and think about Marijn de Vries’ blog on the concept of “getting chicked”. If this is the perfect gift for you or someone you know, click through and buy one, for just $22. Snug is a contemporary craft gallery nestled in the Pennine town of Hebden Bridge, in West Yorkshire. They have some very beautiful things on their website – and their online shop sells some simple and gorgeous cycling-themed prints by Edward Chadwick and Rebecca J Kaye. I particularly love Chadwick’s minimalist designs, with quotes about riding from Einstein and HG Wells – Kaye’s are brighter blocks of colour, and she sells her designs as greeting cards as well as prints. Click through and have a look at the full print range. Thanks very much Nikola Butler for telling me all about these! Edit 13/12/12! Rebecca J Kaye has her own webshop, where she sells more prints, along with t-shirts and cards. Click through and have a look! I really like her Organic Pedal Power Tee, print and greetings card, but there’s all sorts of lovely stuff there! Last week I talked about Lois’ lovely bicycle-based prints, and it was Lois who showed me this – bracelets made out of recycled bike inner-tubes. The designs are laser cut, and they’re hand-finished, and they’re very pretty – just £17 each. There are two designs at the moment – Oxalis and Cinquefoil, and it’s such a simple, effective idea – I hope it’s very successful. 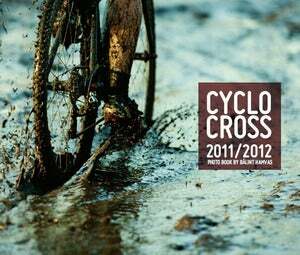 If you read this blog or my twitter, you know that I really, really love the cyclocross photography of Bálint Hamvas, which you can find on his website Cyclephotos.co.uk – so of course I own a copy of his book documenting the 2011/12 cyclocross season. The photos are by Bálint and if his lovely photos aren’t enough, it’s also full of words by tgsgirl, who first got me interested in cyclocross, with her enthusiastic and infectious descriptions of the sport in all its muddy glory. The book is beautiful – and while it focuses on the men’s side of the sport, there’s also a lot about the women’s season, featuring riders like Helen Wyman, Daphny van den Brand, Katie Compton and the untouchable Marianne Vos. It’s a lovely book – and don’t just take my word for it, read this review by fmk on Podium Café, and have a look at the pages on his website – and then click through and buy a copy! If the book is outside your budget, Bálint also has a cyclocross-themed Christmas card, for the mud-fans in your life. It’s a design by Eliza Southwood, based on one of Bálint’s photos, and it’s just £2.99. I’m hoping this is the card I’ll receive from my friends and family this year! Leontien van Moorsel is another multiple world champion with an autobiography. De rit van muj leven – the ride of my life – covers not only Van Moorsel’s many, many successes, but also the dark times of her life, including her battles with eating disorders, and how she overcame them. This is only available in Dutch – and you can buy it on Leontien’s webshop – where you can buy a huge amount of other lovely things too – I miss the feather boas and pink ipod speaker-pigs they used to sell, but there’s pretty much everything you could ever want in sporting kit, including the cycling kit from 2009-2010 pro team, Leontien.nl. Have a look! If German’s your language, how about Christiane Soeder and Stefanie Mollnhauer’s Frauen Radsport – women’s cycle-sport. Soeder raced in the 2000s, winning the women’s Tour de France equivalent, the Grand Boucle, coming second in the Road World Championships and fourth in the Olympic road race in 2008. This book is all about women’s racing, from a physiological and technical point of view, and looks packed full of useful advice. It’s available on Amazon.de for €16.90 – and read more about it here. Karen Darke is a British handcyclist who raced in the 2012 Paralympics, winning a silver in the time trial, and crossing the line in the road race hand-in-hand with fellow-Brit Rachel Morris – they wanted to share the bronze medal, but the judges gave it to Morris, and Darke the fourth place. Darke was paralysed from the chest down after a rock climbing accident at age 21, and her books, Boundless and If you fall... tell the story of how she came to terms with the accident, and went on to incredible climbing, chair-skiing and hand cycling adventures, and more. Click through those links to find out more, and buy the books. I mention Podium Café here, because their Café Bookshelf section has really great reviews by fmk and others – so if you’ve ever wondered about particular cycling books, or want some suggestions of everything from bike-based chick-lit and romance, to hard-hitting discussion, to comedy and autobiography, this is your place to start. I found one of my favourite ever cycling books, The Rider, by Tim Krabbé, from fmk’s review – and when fmk reads the truly dreadful books, so we don’t have to, he does us all a favour! I really recommend browsing around, if you’re looking for books for cycling fans in your life. There’ll be more on Tuesday – cycling gear, decorations, and a whole list of present ideas recommended by real-life women who cycle, from twitter and elsewhere. If you have any ideas of presents you’d like to receive, or you’re planning to buy for friends and family, leave a comment, or drop me a line on prowomenscycling [at] gmail [dot] com – I’d love to hear from you!